We often see pictures of quilts with legs on the Internet. When I am finished a customer quilt–if the weather is nice–I clamp the quilt to the deck railing and take a picture of the finished product. However, the weather lately has been anything but nice and so when the weather does not permit taking the quilt’s picture outdoors, I resort to the quilt hanger with hands and legs. 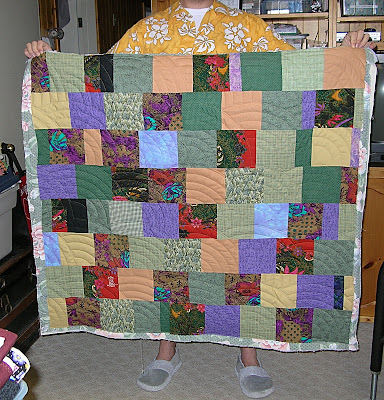 I prefer the 6’7″ model as his height allows for the largest of quilts to be held flat without folds at the floor and his arm span allows for a quilt to be held out nice and wide without wrinkles. The reason I am showing this first picture is not so much to show the quilt but to show you the attire of the quilt holder – well most of the attire of the quilt holder. You can see the bright yellow Hawaiian shirt. What you can’t see is the bright blue shorts! Notice the bare legs and lack of socks. (He did resort to slippers.) He said he was wearing the outfit to bring about nice weather–if you dress like it, it will come. He felt if he dressed like it was Spring karma would intervene somehow and it would be Spring. If nothing else, his outfit brought a bright spot to an otherwise dull day yesterday. Yes, bring on Spring! This is Joey–enjoying a moment in the sunshine as it came through the living room window. And I couldn’t resist this one–all pooped out! Joey looks like he is trying to grab onto that quilt before it decides to go somewhere. This entry was posted in customer quilt, joey, quilt hanger by Norma Hanson. Bookmark the permalink. We need that yellow shirt over here with our -39 wind chills and blizzard warnings out. Love these pictures, especially the bottom one of Joey on the quilt. Really makes me smile. I would love to have a tall quilt holder with a big “wing span” as mine gripes at me when I ask him to hold it straighter or higher, LOL. Got to love Matt’s attitude to bring on spring—wasn’t he cold though, dressed like that? And Joey? A cat is a cat and that is that! Looks like maximum cuddling going on with the quilt. He loves the warmth of the little bit of sun he could find too. Well, I guess I’d better get out the shorts and sandals then, because I would love to try to make all this snow go away!! I like snow, but come February, I am ready for it to start going away, but it is just coming heavier! Ahhh, a very nice quilt hanger indeed! I followed over here from Linda’s blog. What a delightful blog you have. The quilts are beautiful and I’ve fallen in love with Joey. He’s beautiful. And what a great pic of his draped over your quilt. i have quilt pictures with legs too lol!